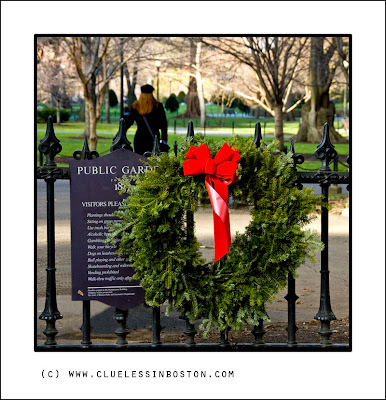 Wreath adorning the iron fence on one of the Boylston Street entrances to the Public Garden. If it weren't for the wreath, I would think it was early Spring. Lovely - won't it get stolen? You must have very law-abiding citizens. I totally agree with Lois, it's simple and beautiful! Boston at Christmas time is so beautiful!! A fine composition in green and black with a wonderful patch of red.